Which U.S. president ranks as America’s greatest depression fighter? Not the fabled Franklin Delano Roosevelt … America’s greatest depression fighter was Warren Gamaliel Harding. An Ohio senator when he was elected president in 1920, he followed the much praised Woodrow Wilson — who had brought America into World War I, built up huge federal bureaucracies, imprisoned dissenters, and incurred $25 billion of debt. Harding inherited Wilson’s mess — in particular, a post–World War I depression that was almost as severe, from peak to trough, as the Great Contraction from 1929 to 1933 that FDR would later inherit. The estimated gross national product plunged 24 percent from $91.5 billion in 1920 to $69.6 billion in 1921. The number of unemployed people jumped from 2.1 million to 4.9 million ... Federal spending was cut from $6.3 billion in 1920 to $5 billion in 1921 and $3.2 billion in 1922. Federal taxes fell from $6.6 billion in 1920 to $5.5 billion in 1921 and $4 billion in 1922. First, the 24% plunge in GDP he cites is nominal GDP, not real GDP. The drop in real GDP was about 5%, as compared to the 26% drop in 1929-33. So with prices falling during this period, the decline in any real variable is less than the decline in the reported nominal variable, which should hold for those reported declines in government spending and tax figures. Alas, Spencer only tells us the qualitative direction of the general price level, which of course is a lot more informative than the disinformation from Mr. Powell. This source, however, lets us know that the CPI fell by 10.85% in 1921 and 6.1% in 1922. In real terms, Federal spending and taxes were still lower in 1922 than they were in 1920, but Powell’s abuse of nominal figures greatly exaggerates not only the size of the post World War I recession but also the size of the decline in Federal spending and taxes. Then again, it is not unusual to see Federal spending and taxes fall after a major war. Our chart was created using information from this source and shows total government revenue in real terms (2000$) from 1902 to 1940. The size of the government during the years preceding World War I appears to be a lot smaller than the size of the government in 1922. 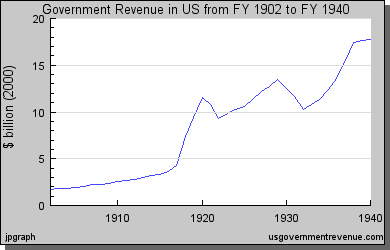 And we should note that real Federal revenues rose for the rest of the 1920’s eclipsing real Federal revenues in 1920. Spencer is right – Jim Powell has put forward a lot of disinformation in his National Review column. But that is nothing new for those who write for the National Review! And all of this is ignoring the substantial borrowing for roadworks at state and local levels in much of the 1920's ... having a Federal system of government only recognized in the fact that you remember to label "Federal Government Spending" but then proceed to treat it as if it was Total Government Spending is a wonderful rhetorical sleight of hand of its own. Men in stupid suits wearing even stupider construction jackets waving bits a paper shouting about numbers. Much more complicated. Putting all your trust and wealth in the hands of what amounts to be a rabble of coke enthusiasts on sat nav shortcuts to penthouse plaza’s; trying to make things go up and down so their killlionaire clients can keep buying goal scoring Brazilian rapists is a sensible and rational way to run a world. Too simple? The good ol bait and switch. Say his result is exaggerated and then conclude it is wrong.